Search is significantly greater than most people credit it. The ability to find content on your site is probably the most important aspect of running a successful blog. The Defacto search built into WordPress is helpful, but far from perfect. Search Unleash WordPress Plugin introduces powerful new methods to scour through your blog’s data, including full-text searching and Lucene powered searching. A search index is a collection of information that is stored about each of your posts, pages, and other elements that contain text. This “Index” is then used during the searching process to quickly find the information that is relevant to the search terms provided by the user. 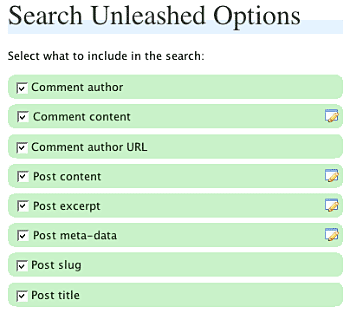 Search Unleashed offers three types of search indexes. 1. Default WordPress: The Default WordPress search index is what all WordPress blogs come with out of the box, and while this search is acceptable for most blogs, it’s a bit slow and doesn’t offer much intelligence. 2. Full-Text Search: As WordPress uses MySQL as its database, it’s able to leverage MySQL’s built-in full-text searching. MySQL’s indexes are super fast, tested, and true. However, it can become slow when you are dealing with a blog that has more than 10,000 or more posts. 3. Lucene: Lucene is an open source product released by the Apache Foundation. The same company that brought us the insanely popular Apache web server that your blog most likely runs on. Lucene is the undisputed heavyweight in open source searching. With its unique searching and indexing algorithms, Lucene will absolutely deliver the search goods. Once you have decided on which Search Index to leverage, you will need to build your first Index; we highly recommend Lucene. If you have decided to use the default WordPress index, then you can skip this section. To run your first index, click Search Index from within Tools | Search Unleashed. To initiate the indexing, you will need to click Re-Index. Once you have completed your first index, you will not need to rerun it, as this process will now happen automatically. However, re-indexing your site is one potential solution if your blog search is not behaving properly, which can occur if data corruption happened during the indexing process. Previous Post How to Customize WordPress Post Order?